1. 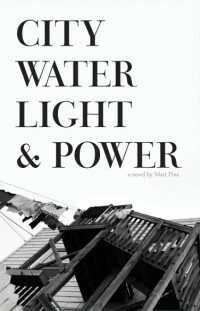 I’m in awe of Matt Pine’s prose style. A lake has “the same texture and tone as ink spilled onto silver.” A black dress has “the same cling and quality as plastic wrap on American cheese.” These similes give me goosebumps. 2. The frisson of encountering high style in a world that no longer much values it. 3. City Water Light & Power explores the angst of being young in the city and not knowing the score. It’s about twentysomething Chicagoans figuring out how to survive in body and soul — the alternatives, in this novel, are selling out or breaking down, in bars where salaries are “revealed like flashed genitalia” or in alleys where it’s “spiritually dangerous walking there dispirited after dark.” Your choice is to be one of the manipulators, or someone who walks without a destination — both flavors of desperation. 4. Chicago is a character in this novel. A machine whose workings are dangerously hypnotic. 5. A study of corruption and alienation that gives me that sense of a ruthless and inscrutable society I get from Fitzgerald, say, or Salinger. Matt Pine writes of venality in a tone of innocent fascination — he is sensual, aggrieved, and mystified by ordinary life, in a classic American tradition harking back to the Puritans. 6. The demolition of a dive bar stands for what’s being lost. The bar is called Lewis & Carol’s… perhaps to suggest a world down the rabbit hole or through the looking glass? 7. I like it that this bar seems to be the only thing keeping Jake from becoming an alcoholic – after its destruction, Jake takes to drinking outdoors. Somewhat illogically since the novel acknowledges there are other bars in Chicago – one might even say too much of this novel takes place in bars… But these bars are full of phonies, not like Lewis & Carol’s, which stands for community. 9. Adrian is a character who success brutalizes. He is seeking the wrong nourishment, acquiring what David Mamet has called “the canting language of the real-estate crowd.” There’s beauty in the process of making ugliness happen, Pine suggests, but it’s a lonely beauty. 13. City Water, Light & Power is the largest municipally owned utility in the state of Illinois. 15. After his job gets outsourced, Jake moves through the alleys “as carefree as a bead through a pachinko machine.” A homeless guy is described as “not riffing, but reciting, perhaps a poem or an elaborate and damning contract, its words learned by humiliated, horrified re-readings once the offer and stipulations, the intents and considerations were binding and his mistake entirely manifest.” Most of the characters in this novel feel trapped. 16. Jake and Michelle spend much of the novel playing phone tag with each other, but it’s set up so they’re the implied judges of each other’s conduct. 17. Chicago as a crowd coming out of a sports bar to watch a demolition. Democracy as a rigged spectator sport. 18. A career as the trajectory of a projectile. Everything is deceptively packaged. 19. The novel as dive bar. 20. Krysminski, a perfect incarnation of “the man,” is a business guy whose HQ is a kind of labyrinth. “Feeling terrible gets things done, Adrian,” he says. I was kind of hoping for another scene with him in, but maybe it’s appropriate that the last we see of him is his business logo on some scaffolding. He’s the only character in the book whose actions have the effect he intends. 21. Matt Pine asks – what should we be loyal to? 24. Bowling trophies are compared to polytheistic shrines. 25. My father, who towards the end only read Mafia novels, would have thought Jake was a putz, and would have wanted more about Krysminski’s connections. I asked my father once if there were any Mafia novels he recommended, and he found the question odd – by then he didn’t care if the novels he devoured were good or not, only that they were about the Mafia. This seemed strange to me, but I’ve come to learn his attitude is more typical than mine — a hunger for well-written books is rare compared to a taste for books about the Mafia/unicorns/whatever somebody happens to be into. Which makes me wonder — is liking good prose some kind of psychological defense mechanism against something? Life’s sheer destructiveness? The prevalence of Krysminskis? Do we enjoy similes because they imply an order the world actually lacks?